Why do I need to power flush my central heating system? Pipework and radiators are normally power flushed with the addition of mobilising chemicals before a new boiler is commissioned OR in the event of poor performance of a part or the whole of central heating system. This might be demonstrated by some radiators being hot at the top but noticeably cooler at the bottom. This is usually caused by the build up of 'sludge' in the pipework, radiators and valves of the effected part of the system. The 'sludge' is usually mainly magnetite and is the material corroded off the insides of the steel radiators as a result of the water/steel contact or the electrolitic reaction between the different metals in a central heating system. Cast Iron heat exchanger, copper pipes, brass fittings, steel radiators and perhaps alloy decor radiators. 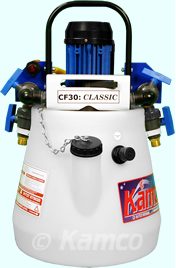 A special unit can be hired such as a Kamco and this is usually adapted on to the pump valves (pump removed) and the content of the central heating system cycled through the pipework at a much higher flow rate than that normally achieved under normal running conditions. The water is then dumped into the flushing unit where the heavier contaminates drop to the bottom. Radiators can be switched in and out of the flushing process. The flow can be reversed to assist agitate the deposit. Areas prone to sludging are horizontal runs of gravity hot water circuits. Especially if run in 15mm. drops to conservatories done from upstairs bedrooms. These tend to act as sludge traps as they are usually done in 15mm plastic barrier pipe which is then further reduced so reducing the internal diameter available and flow rate. The installation of a magnetic trap on the return of the central heating loop can help trap the metallic deposits and prevent them from getting back to the heat exchanger where they can cause blockages and reduce the life of the heat exchanger and effect it's efficiency. Power flushing cannot be guaranteed to fix a problem with poor flow and ultimately it may be that sections of pipework causing the problem would need to be identified and replaced. However, it is fair to say that done properly, those parts of the central heating system than can be cleaned will have been cleaned. However, if a pipe is blocked with a solid slug of sludge then it may be better to try to replace the pipework initially rather than power flush.